This is Lindsay’s fourth book, and it promises not to disappoint. I own the three previous HH books, and I love them all. So when Lindsay’s publishers posted they were looking for bloggers to help promote HHLL, I jumped at the chance. Why not? Who doesn’t love delicious and easy-to-make, low-fat, oil-free, vegan goodies?? 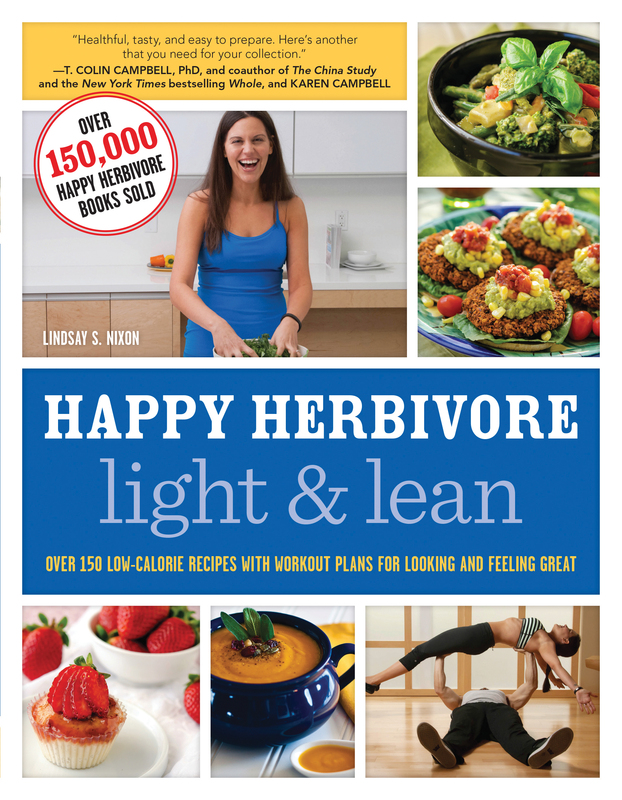 Happy Herbivore Light & Lean: Over 150 Low-Calorie Recipes with Workout Plans for Looking and Feeling Great is a unique addition to the Happy Herbivore family. This time, Lindsay has included a fitness component. 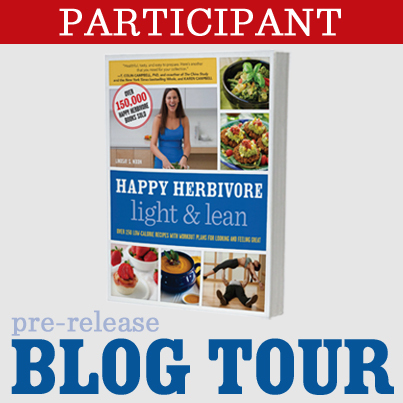 If you follow the Happy Herbivore blog (like I have for many years), you know that Lindsay used to be a personal trainer. And, since being active is an important part of any healthy lifestyle, it’s only natural that fitness and food make an appearance in this latest addition to your plant-based book collection. VV: After four cookbooks, where do find your continued motivation? VV: Since Light & Lean introduces readers to the fitness component of HH, are you going to continue to incorporate it into the mix? For example, are you perhaps going to offer fitness plans in the future? VV: With the holiday season upon us, what’s your best tip not only staying plant strong but light and lean as well? HH: Have a plan in place. Have a strategy before you walk in the door to a party, hit the buffet line or sit down to dinner. If you want to indulge a little, great, but decide what and how much before you start feasting with your eyes. I was really interested in the motivation part. I can barely come up with enough content for a weekly blog post, let along fill 4 (6?!) cookbooks with tasty and unique recipes and stories that keep people coming back for more. One afternoon I grabbed what I thought was corn from the freezer but later realized it was mixed vegetables. Once they thawed on the counter I knew they weren’t going back in, so I looked for a new, inventive way to use them. A can of kidney beans started calling, and before I knew it I had a vegetable-filled meatloaf in the oven. 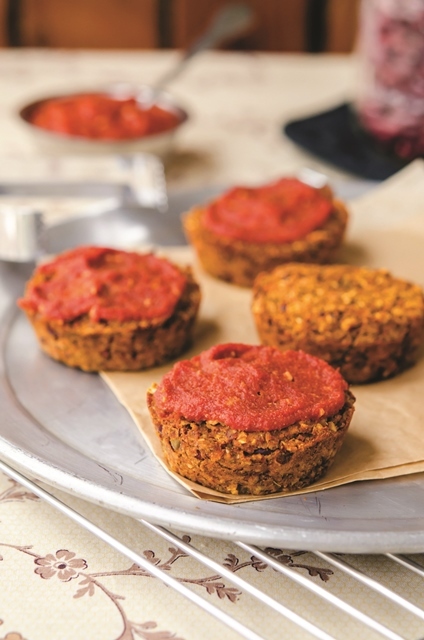 Since this meatloaf is baked in a muffin tin (great for serving sizes and portion control), I call it meatloaf “bites” and, yes, leftovers are great as a burger! Preheat oven to 350˚F. Line a muffin tin with paper liners or use nonstick. Mash beans in a bowl with fork or potato masher until well mashed. Add remaining ingredients, except oats, and stir to combine. Stir in oats. Spoon into muffin tin and pack down. Bake for 20 minutes until crisp on the outside and fairly firm to the touch (firms a bit as it cools). Serve with ketchup, Quick Gravy (pg. 188), etc. Disclaimer: Lindsay’s publishers offered to send me a copy of HHLL for participating in the blog tour (but I would have done it anyway. I’m always happy and willing to help promote a healthy, plant-based life!). Aren’t these the cutest?! See…finger foods! And that ketchup frosting? What a great idea! Are you excited yet? You can pre-order your copy of HHLL here. Books are scheduled to be available at the beginning of December, but I’ve heard through the grapevine (OK, it was on the HH blog *wink*) that preordered books may ship sooner. Order now, and you might have a new resource for your [American] Thanksgiving meal planning! Follow Veggie V on Facebook! Follow Veggie V on Twitter! Follow Veggie V on Pinterest! Follow Veggie V on Instagram! Join the Raw Fusion Rest here! Thanks for the review! I think I need to order this book.